This year marks MB&F’s 10th anniversary, and to commemorate the milestone, the brand will present a series of anniversary pieces throughout the year with the theme ”A creative adult is a child who survived”. The first piece is an impressive mechanical table clock called Melchior. “A long time ago in a galaxy far, far away, man’s best friend was his robot. As a 10-year-old fan of Star Wars, I knew Luke Skywalker could never have prevailed had it not been for droids like R2-D2 – a loyal, resourceful and brave robot who was always saving his friends. As an only child, I imagined having my own robot companion… Melchior makes that childhood fantasy a reality. 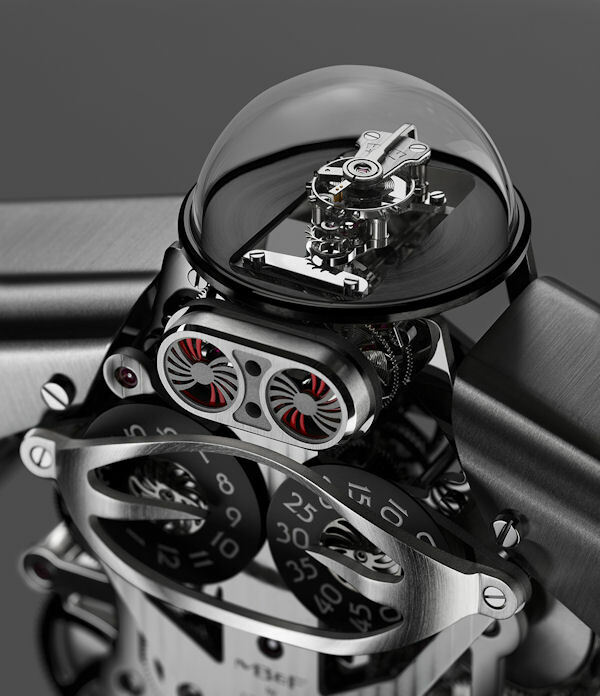 Melchior was conceived and developed by MB&F, and engineered and crafted by L’Epée 1839 – Switzerland’s only specialized high-end clock manufacture. 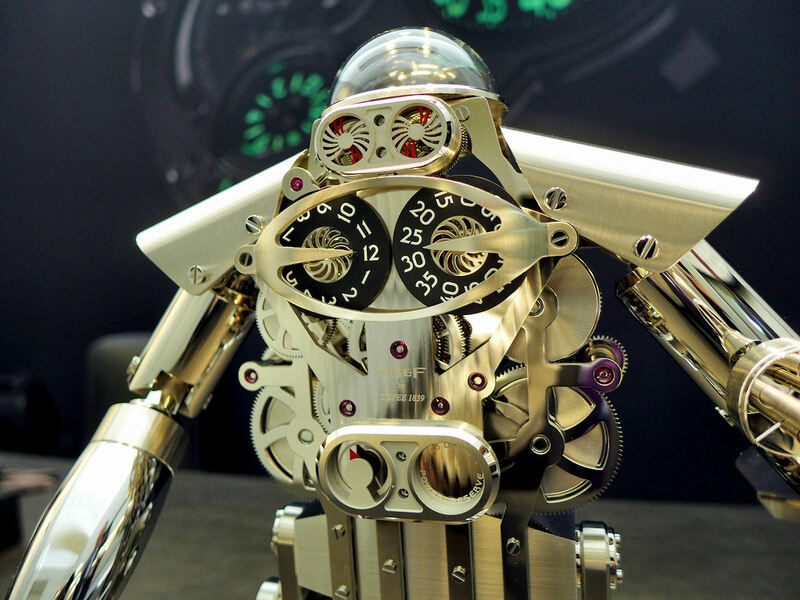 Büsser developed the concept with designer Xin Wang, selecting a high-end L’Epée clock movement and reimagining it as the mechanical head and torso of a robot, complete with articulated arms – the right one packing a rocket launcher, the left a Gatling gun. 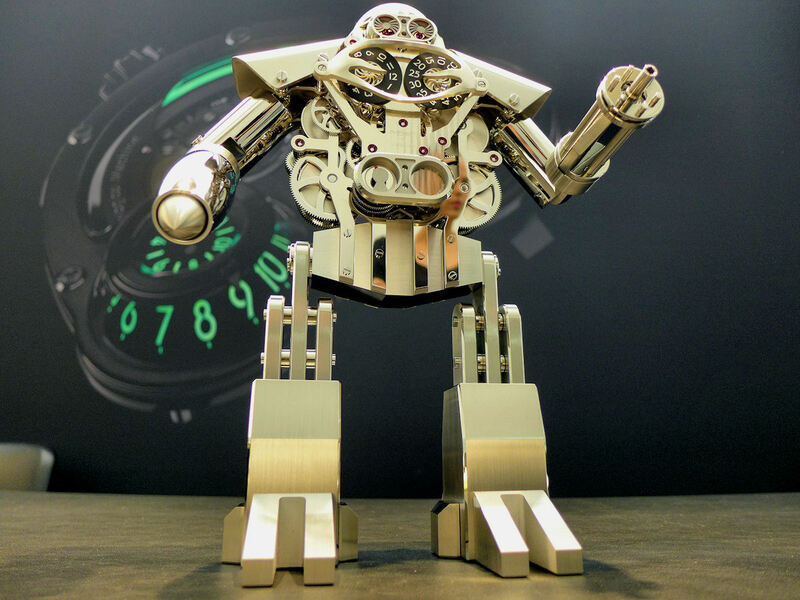 Melchior may look like something out of a Terminator movie, but in fact it’s a high-end table clock featuring jumping hours, sweeping minutes, double retrograde seconds and a 40- day power reserve made possible by five mainspring barrels. Jumping hours and sweeping minutes are displayed on Melchior’s chest via discs, with pointers incorporated into the breastplate – while the dial on Melchior’s abdomen is the power reserve indicator. Melchior’s eyes move in retrograde fashion, marking off 20-second intervals. A combination of fixed vents and revolving discs give the impression that Melchior is closing and opening his eyes. Melchior’s head appears to have been inspired by Forbidden Planet’s Robby the Robot. A custom, polished glass dome protects the regulator, beating gently at 18,000 vph. Büsser says the dome acts like a skull, and the regulator symbolizes Melchior’s brain at work. Melchior’s upper arms rotate, and his lower arms pivot up or down. His Gatling gun detaches and doubles as the winding/setting key for the movement. Making the key integral to the design helps to insure that it will not be misplaced. Melchior is comprised of 480 components, each one machined and finished at L’Epée’s Swiss atelier, except for the 50 jewels. 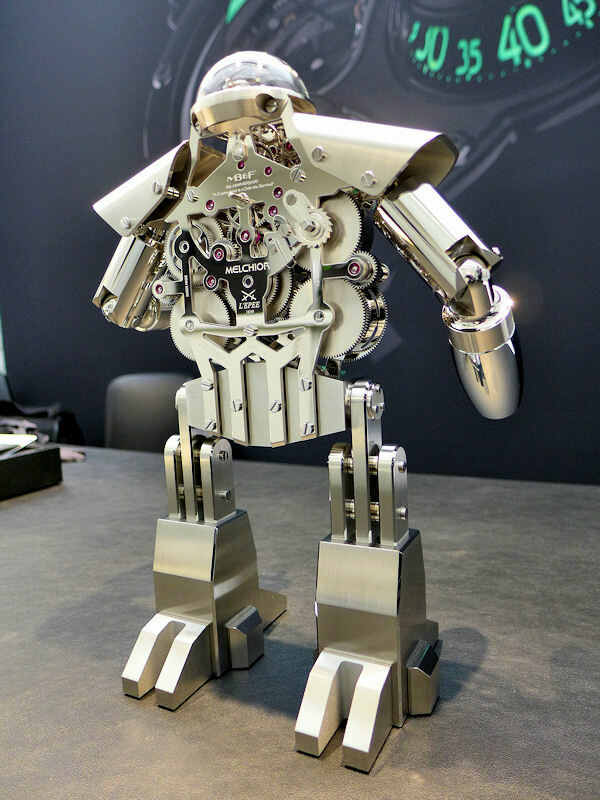 The movement incorporates 334 components, while another 146 pieces comprise Melchior’s bodywork and armor. Needless to say, the original design requires quite a few unique components. Melchior stands 30 cm, or just under 12 inches, high and weighs 12 kg, or about 26.5 pounds. He will be produced in a limited edition of 99 pieces with both light and dark finishes available, priced at CHF 35,000, plus tax. 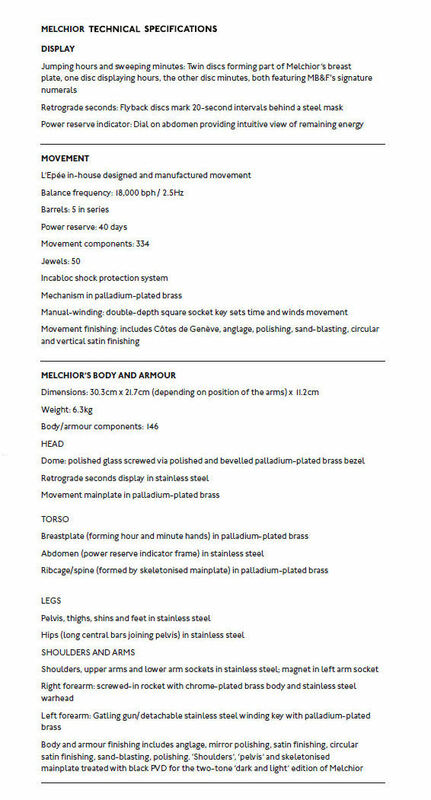 Find complete specifications below.